In the aftermath of Nina Giordano's murder; the love of her life, Alex is blackmailed into sharing her home, her daughter and her bed with the psychopath responsible. Amidst the abuse and terror of living with FBI Director Megan Kelly, Alex vows for the sake of her daughter, to get out from under Meg’s control one way or another. She joins forces with attorney, Amy Pannuzzelli in search of the evidence of the horrific and senseless murder of Nina and her brother, Nick. The search leads the pair to embark on a relationship that ends before it begins when a new neighbor catches Alex’s attention. Her similarities to Nina begin to pull Alex closer and closer to the mysterious stranger who quickly capture’s not only Alex’s heart but that of her daughter. Unbeknownst to Alex, her new neighbor has an agenda of her own; she too is searching for the evidence that with tie Meg to her grizzly crimes with the help of CIA Operative Jennifer Lawless. Their clandestine agenda will need to be fast tracked if their identity is to remain a secret. Will they be able to find the evidence necessary to finally bring Megan Kelly to justice before time runs out for Alex and Nina? Honestly I would not say that it’s the most believable plot, but none-the-less, it a good read. I suspected towards the end of book #1 that Nina was going to survive, so book #2 is primarily about her recovery and journey back to Alex when she does and then what it takes for her to rescue Alex from Meg. As much as I have enjoyed both books, I really wish that Jen would have just put a bullet in Meg’s head and hope that after whatever happens in book 3 that Meg will forever no longer be a threat!!! That women is evil! 5.0 out of 5 starsExtremely captivating! Something incredible happened, something that brought tears in my eyes. Their lives are still in danger and once again, violence intrudes. As the story unravelled, my heart speed went up drastically. It was heart-wrenching and I could feel all the fear as if they were haunting me. The suspense is intense, the drama compelling and the romance is excellent. Again a lot of violence but perfectly suited to the story. I thought, the first story was awesome but this one is certainly a masterpiece too. It has a bunch of twists and turns that kept the story extremely captivating. It grabs you and doesn't let go. Highly recommended. 5.0 out of 5 starsThumbs up. I enjoyed this book so much that I finished it in one day. 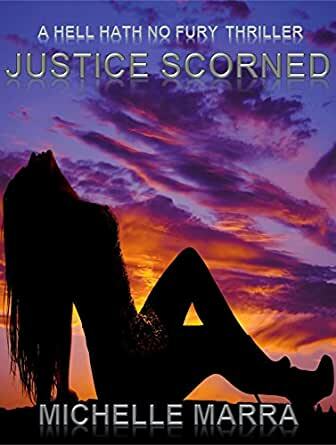 You should read "Fallout" before reading "Justice Scorned" to fully understand what Nina and Alex have gone through. Not as intense as the first book but still keeps you at the edge of your seat. Can't wait to read more from this author. Thank you Ms Marra for this sequel.....loved it! Now am waiting for the 3rd installment. This book was well written which kept me on the edge from start to finish...had to read it in one sitting, I just couldn't put it down lol. Oh, and the scene where Alex was at the cemetery, brought tears to my eyes.